Fans of hit preschool TV show Tree Fu Tom are blown away by the release of RC Tom’s Leafboard Adventure. Now the kids can re-enact some of Tom’s best and thrilling moves with this detailed radio controlled customised skateboard. The infra-red hand controller can create all sorts of wicked moves and even has a magic spinning mode! The removable Tom figure can be easily taken off the Leafboard for separate play. 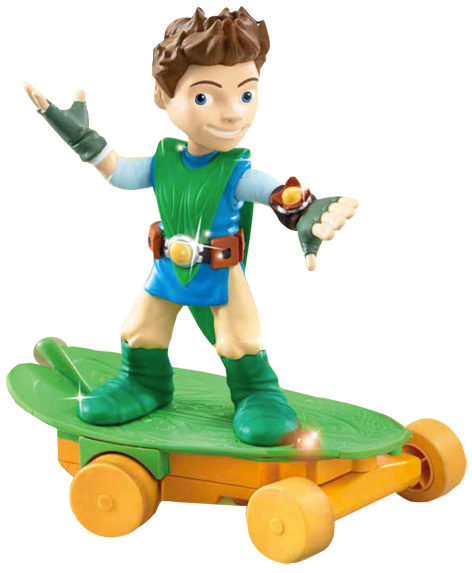 This impressive toy is part of the Tree Fu Tom collection supplied by Flair in the UK. Other toys include a large Castle Playset, a Squizzle Pitch Playset and the amazing Zigzoo’s Wagon Playset which comes with a figure of the incredible inventor himself. Please tell us what you think of the RC Tom's Leafboard Adventure by Flair.